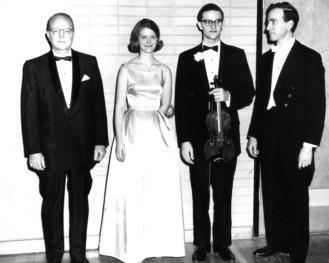 David Rosenboom, violin, with trombonist Dr. Guy Tourney and conductor Harold Bauer. Since 1953, the Quincy Symphony Orchestra Association has sponsored a competition for young musicians. The purpose of the competition is to give outstanding high school musicians the opportunity to perform as a concert soloist, accompanied by a symphony orchestra. Such a performance can be a springboard for a young person to choose a lifelong commitment to the arts. The contest winners receive special publicity which can improve their scholarship opportunities as they move on to higher education. The annual Young Artists Concert rewards excellence in musicianship and enriches not just the performer, but also the audience and orchestra members. The competition is open to current 10th-12th graders who attend school within a 70 mile radius of Quincy. The Young Artists Competition is sponsored by Encore Symphony Volunteer Council and the Martha McCrory Foundation. Area instrumentalists and vocalists in grades 10 through 12 are invited to participate in the 64th Annual Young Artists Competition on Saturday, December 15, 2018. The winner(s) of this regional contest will have the opportunity to perform as a guest soloist with the Quincy Symphony Orchestra on Sunday, February 10, 2019, at 3:00pm in the QJHS Morrison Theater. Application forms and competition rules and procedures are available below or by calling the Symphony Office at 217/222-2856.